Toma nocturna de la Estela 18. Complejo Sureste. 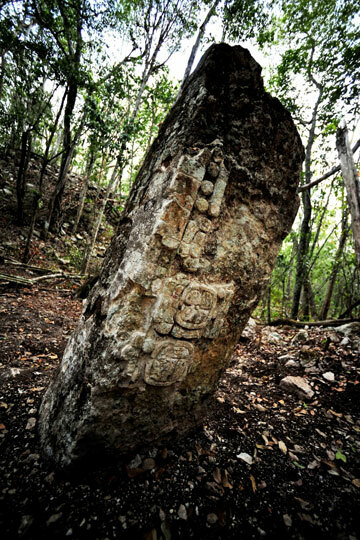 The 19 steles found in the ancient Mayan city of Chactun, recently discovered in the southeast of Campeche, will allow archaeologists to collect new data about the ancient inhabitants of this region, located north of the River Bec, of which we know little about. The archaeologist and epigraphist Octavio Esparza Olguin signaled that epigraphic registries are not abundant in this region, which is why the pieces found are of such importance. Fragmento de la Estela 2. Complejo Oeste. 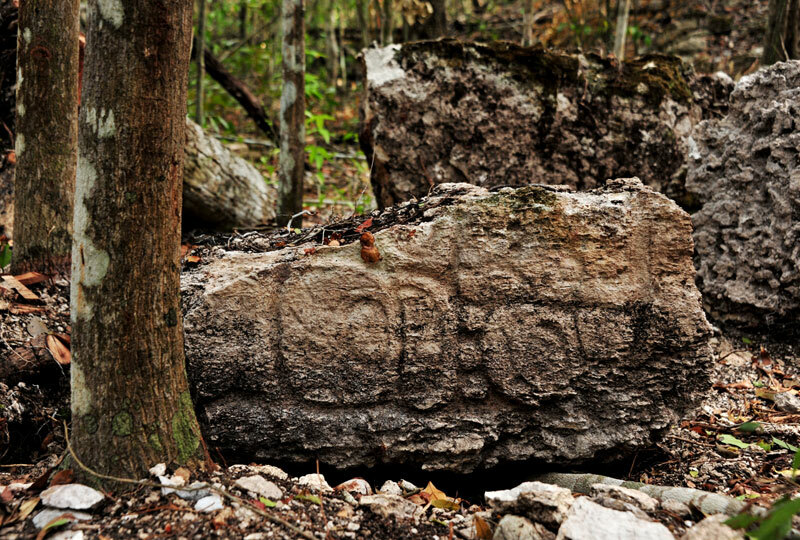 The expert in epigraphy, who is part of the expedition endorsed by the National Institute of Anthropology and History (INAH), and who advanced deep into the Biosphere Reserve of Calakmul, explained that from the pieces found at the site, three are in a good state of conservation, and seven still allow the observation of hieroglyphic writing, although its conservation state is so precarious that events and precise dates are difficult to appreciate. Another nine remain severely eroded. 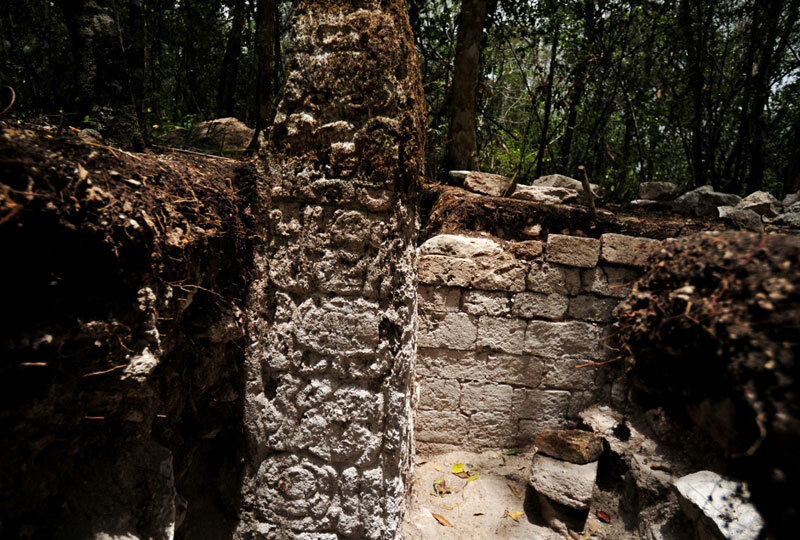 Esparza Olguien said that it’s exceptional that Stele 1 still has stucco remains, because this material is rarely conserved in tropical weather after so long. The piece gives name to the place, since it makes reference to a “Red Stone” or “Big Stone”, which was set up by a character named K’ihnich B’ahlam, in the year 751 AD. 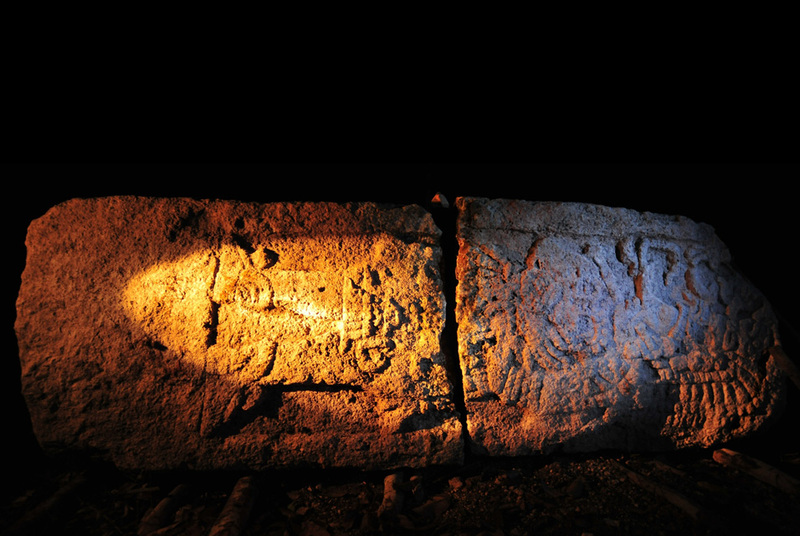 Octavio Esparza, from the National Autonomous University of Mexico (UNAM), said that many of the pieces found at the site –which flourished in the Late Classic period (600 through 900 AD)– were reused some time later. “The majority of the fragments were placed in the ball courts and the plazas in the West and Southeast”. The epigraphist mentioned that Stele 14 is a clear example of how this site was used by later civilizations, since it was buried and a wall was attached to its front, which prevents archaeologists from seeing the character clearly, although a long calendar date corresponding to 731 AD and part of a lunar cycle can be distinguished. They also found remains of late offerings in some monuments, such as the case of Stele 1, where it was possible to rescue some ceramic censers that were deposited towards the end of the Late Classic period or beginning the Posclassic period (900 through 1200 AD). “Many of these pieces –added the expert– where placed by people who were on a pilgrimage as an act of respect, although they probably didn’t understand the meaning of the hieroglyphic texts”.